Observations of transits of Venus, as well as observations of partial eclipses of the Sun by the Moon, do not present major technical difficulties but it is absolutely essential to respect the basic rules for protecting eyes. Of course the beauty of this natural phenomenon will be appreciated better with the help of an optical instrument (such as a pair of binoculars, a small refractor or a telescope). In any case, the Sun's light must be filtered to reduce its luminosity by one hundred thousand times in order to avoid damage to the eye. One has to be extremely careful because without proper protection there is a real risk of burning the retina and causing blindness. The apparent diameter of Venus on the solar disk is about one arc minute (1/60 of a degree or 1/32 of the apparent solar diameter), so the phenomenon is easily visible with the naked eye through safety glasses, specially designed for that purpose . The details that can be distinguished on the solar surface are of this order of magnitude, but their visibility will be strongly enhanced by high contrast. Remember that direct observation of the Sun is dangerous. It is essential to filter and attenuate the ultra violet, visible and infra red light. The only recommended protection is a pair of solar eclipse glasses, EEC certified and made from Mylar or black polymer sheets of neutral density 5 or above. With binoculars: Ordinary binoculars (typically 8 x 40 to 10 x 50, the first number being the magnification and the second one being the diameter of the entrance lens in millimetres) are quite convenient. But light filtering is mandatory and has to be done correctly. The two large entrance lenses must be covered by a filter made of Mylar or black polymer to reduce the light intensity one hundred thousand times. Never put sheets of Mylar or black polymer at the eyepieces of binoculars instead of covering the entrance lenses ! Light concentrated on that part of the binoculars could burn the protective screen and damage your eyes immediately and irreversibly. With a "solarscope": The solarscope is a low-cost instrument, which is designed for group observations without endangering eyesight. It is made of cardboard, may be folded and is easily transported. The optical system of this device projects the solar image onto a white screen (about 10 cm in diameter). It is strongly recommended for group observations, especially with children, schools, astronomy clubs, etc. 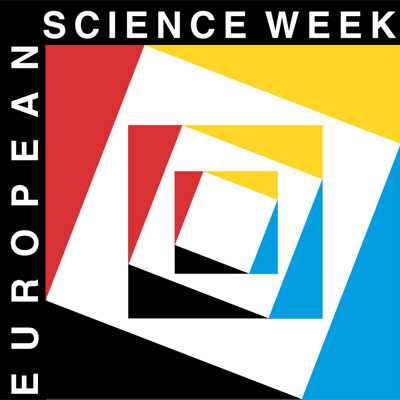 With a small astronomical refractor (or telescope) and a full aperture filter: An astronomical refractor is basically made of a converging objective lens (generally an achromatic doublet of two lenses with a combined focal length f and aperture diameter D) which forms an image of the observed object in the focal plane. In the case of solar observations, a 60 mm to 100 mm aperture refractor with a relative aperture ratio f/D about 10 is convenient. At the focus of the doublet one can put a light sensitive detector, for instance a 24 x 36 mm photographic film, a CCD or a CMOS detector of a digital camera (a reflex camera without a lens), or the detector of a webcam (also without a lens). The diameter of the solar image, at this location, is α x f, α being the apparent angular diameter of the Sun (32 arc minutes) measured in radians, providing 9.3 mm per metre of focal length. It is also possible to observe the solar image through an eyepiece, with the eye, or a compact digital camera, or a videocamera, this time with their own lens and mounted with a mechanical support behind the eye piece. 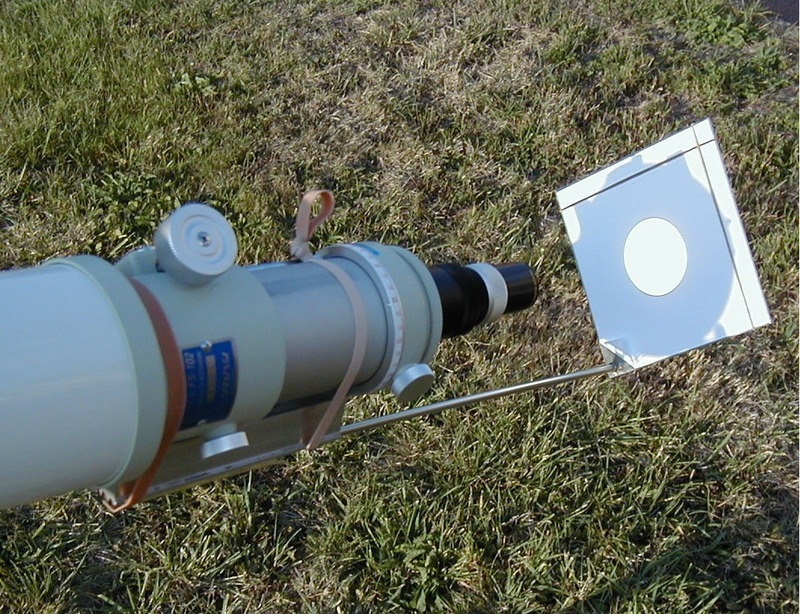 It is imperative that the entrance objective of the instrument is covered by a full aperture filter (please see the picture below), made of an optical quality glass plate on which a thin layer of aluminium has been deposited, in order to admit to the instrument only one hundred thousandth of the incoming solar light. The transmission of these filters (neutral density 5) often varies with wavelength, so they usually give orange images but the quality of the image is not affected. Such filters also block infra red light which is essential for eye safety. With a small astronomical refractor by projection: This method is strongly recommended, because several people can observe simultaneously around the instrument without any danger. It consists of using the eyepiece of the refractor as a projection lens (see picture above). This technique will provide a much better image than the solarscope. 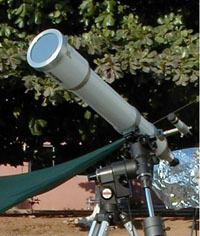 In order to form a solar image on a white screen, the eyepiece is moved slightly outwards so that it will work exactly like a magnifying lens. The beam can be reflected downwards with a flat mirror or a prism to make viewing easier. A full aperture filter cannot be used with the projection method so be careful of the light beam (do not put your eyes into the beam!). Imaging the solar surface with a webcam at the primary focus of a refractor or a telescope is easy and popular with amateur astronomers. The instrument should be protected by a full aperture filter , and the webcam (without lens) should be mounted, after removing the eyepiece, with a specific adaptor. Remember that the solar diameter at the focus of a refractor is 9.3 mm per metre of focal length, and that the size of the detector is very small (about 3 x 4 mm). Hence, for a focal length of 1 metre, the field of view will be reduced to only 10 arc minutes (one third of the solar diameter). This is perfect to observe the Venus transit in detail. The recommended webcams are only those having a removable lens. They connect to the USB port of a computer which controls the camera and records the data. Webcams allow the use of short exposure times, thus freezing atmospheric turbulence (1/100 s is a typical value for a f/D=10 optical system protected by a full aperture filter of neutral density 5). The noise can be reduced by adding several images in order to get a fine image with a good signal/noise ratio. Freeware for this purpose is available on the Internet. It is quite possible to use such devices, with their own lens (generally not removable), in association with an eyepiece. The eyepiece and the camera lens will work like an afocal system, giving a magnification of the primary solar image equal to the ratio of their respective focal lengths. Compact cameras or videocameras can be mounted just behind the eyepiece using a mechanical support. In that case, the instrument has to be protected by a full aperture attenuator , as above.